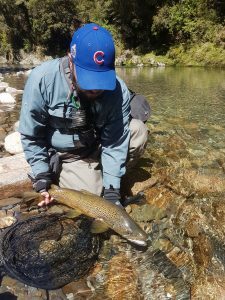 FYI: I am unavailable to guide on NZ Public Holidays or for single days on any Sundays between December 16th, 2018 – March 17th, 2019 … (This is a gesture to allow local anglers to fish our local rivers without competition). Red squares indicate those days that I am already booked and am NOT AVAILABLE to guide. Please check my schedule here to search for days I am available to guide you.